That’s the headline of a story I did with my colleague Corinne Abrams, out Monday. India’s biggest mobile-payments startup, Paytm, has wooed hundreds of millions of users and attracted investment from Warren Buffett’s Berkshire Hathaway Inc. 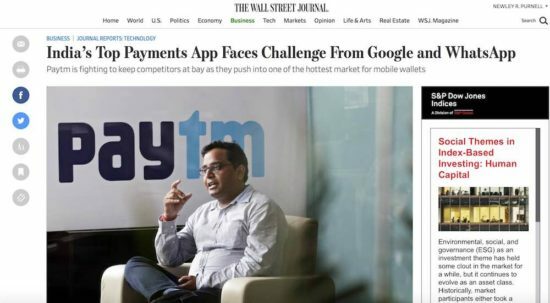 The biggest challenge for its charismatic founder, 40-year-old Vijay Shekhar Sharma, lies ahead: Keeping Alphabet Inc.’s Google and Facebook Inc.’s WhatsApp at bay as they push into India, the world’s hottest new market for mobile money. Paytm’s popular smartphone app, which can be used to pay for everything from auto-rickshaw rides to movies and utility bills, handles some 500 million transactions a month across its network. Paytm, launched in 2010 by Mr. Sharma’s One97 Communications Ltd., has dominated India’s payments space since late 2016. That is when Prime Minister Narendra Modi nullified India’s largest-denomination notes to curb corruption, triggering a cash crunch. Faced with long lines for ATMs, consumers flocked to the Paytm app.